Introducing Gus, Bella's boyfriend the Borzoi. I labored over which picture to use for Gus' debut appearance on Bringing up Bella for a few reasons: he is so photogenic, so lovely and so important. More on Gus in future installments. In the meantime, feel free to rave about him in the comments. How many people does it take to change a scared-y dog? I think there are different kinds of fear. There is the sudden spook of finding a spider crawling up your leg that makes you yelp, gets your hands sweating and heart racing but that goes away after a minute or two. And then there's the deep-seated fear that lingers, settling down in your gut filling long nights with an overwhelming sense of dread. There are probably many shades of gray in between. When we were looking to adopt a new dog, we came across a truly fearful dog named Ernie. Ernie was a beautiful black little Boxer mix who was painfully cute and just as painfully scared. We met with his foster folks in their backyard and spent about an hour with them. I managed to touch him - once. Jan was not convinced. ("What are we supposed to do with a dog that we can't even touch?") The next day we met Bella at the shelter and, while certainly scared, she didn't have the luxury of hiding behind foster folks so she chose to hide behind us instead. This, we felt we could work with. Now I've had some experience with shy dogs: my family had dogs my entire life and I'm not sure I can count on two hands the number of stray dogs my sister brought home that dad then coaxed out of their shell with his patient, positive training. But never do I remember a dog quite as fearful and shut down as Bella. She had both the sudden, quick fearful reaction to things that startled her as well as the deep-seated variety that was her foundation of understanding the world around her: life is scary, best be prepared to run. I learned fast that "bolting" was Bella's way of "coping" which might have been ok if it didn't usually happen at the other end of a leash sending us both sprawling and frightening her more in the process. Not so sure about this, mom. As uneducated as I was at the time, I still had no intention of 'forcing' her to deal with the things that frightened her. If she was frightened by a barrel in the yard, we'd just walk a wide berth around it, or choose another path. If she was too afraid to enter the garage, she could go out the front door instead. Thanks to my father's patient example, I knew not to push her past her limits, berate her for her fear or try to physically coerce her to "get over it". What I didn't know was quite how to help her overcome her deep-rooted fear so that she could function and live a somewhat calm and pleasant life. Which leads us back to our first little fearful friend, Ernie. That meeting had more import to it than I realized at the time because it was through Ernie's foster folks that I learned of one of the greatest resources I would use on this new journey with Bella. Ernie's foster dad was studying dog training and learned much of what he was using to work with Ernie at fearfuldogs.com, run by Debbie Jacobs. He highly recommended the site so I went home and started reading. 3 years later and I have never stopped. So much of what I found there instinctively made sense to me. Just reading the words "It is ok to comfort your dog" made my heart sigh with relief. The "Getting Started" section provided me with new insights into triggers and thresholds, tools to improve my canine body language skills and sometimes even just an encouraging "you are not alone in this" reassurance. I bought at least half the books recommended in the Resource section dealing with fear and shyness, including Debbie's own "Guide to Living With & Training a Fearful Dog". It was as if a whole new world had been opened to both me and Bella. We were also very fortunate to have found an awesome trainer early on. I know now that one should research the trainer they choose for their dog as thoughtfully as they choose their dog, but at the time I didn't even know there were options. So let me just say thank you to whatever reigning power it was that allowed us to stumble upon a great trainer who just happened to specialize in shy and fearful dogs when we signed up for the only class available to us at a local pet supply shop. Oh, that first class - well, that's a story for another day but thankfully Sheila Kamath didn't throw us out (yes, that was a concern we had going in) and has been a wonderful friend to us over the years, always understanding of Bella's quirks (as well as that of her owners). Being scared is verrrryyyy tiring. You might have noticed there seems to be an "ad"on the right over there. Don't worry, I haven't lost my mind thinking I'm going to get rich advertising off this little blog. That "ad" is just there for Petfinder.com's "Adopt-a-Less-Adoptable-Pet" week. I was planning to write a version of this post next anyway so it's rather convenient timing for PetFinder to run a campaign like this. A lot of people wouldn't want a dog like Bella - she's shy, she's fearful, she's a bit of a challenge and a whole lot of work. She has hypothyroidism. At 60 lbs, she's fairly large. She's even black. All of this puts her in the "less adoptable" category. A lot of people probably wouldn't have wanted a dog like Beau either who only required a little bit of work, a few extra dollars a month and just a little education. But if I had to have written up an adoption notice for Beau, I would have had to disclose that he had epilepsy. Later he also went deaf but neither condition proved unmanageable. In fact, Beau was the reason I wanted a "special needs" dog - having already had one, I knew how awesome the reward of caring for them can be. Special needs means different things in different dogs but many people hear those words and discount the dogs without bothering to learn more. Sometimes, as in Beau's case, special needs means only an inexpensive pill twice a day to control his epilepsy. Sometimes, as in Bella's, it means a little more. The list of traits that make an animal "less adoptable" might surprise you and there is often little reason to let that discourage you from considering a dog with them. Age - Everybody loves puppies but senior dogs need love, too and have so much of it to give. They're usually trained and house-broken so you get all the benefit with almost none of the effort. Size - I'm a "big dog" kind of girl myself so this is another one I've never understood but I do realize not everyone has room for large dogs. If you do have room, why not consider adopting one? Large dogs, even non guard-dog breeds, tend to be intimidating enough to keep most trouble away from you while out on a walk. Breed - "Ban the deed, not the breed." Certain breeds are difficult to place because of public perception, stereotypes and media hype and frenzy. Bully breeds and guard dogs languish unfairly in shelters when they would make wonderful companions in a home of their own. Health - Missing limbs, diabetes, hypothyroidism... These health issues are all treatable or simply cosmetic. Dogs with these health concerns can live long happy lives and the amount of effort or expense required to manage these "problems" is often very slight. 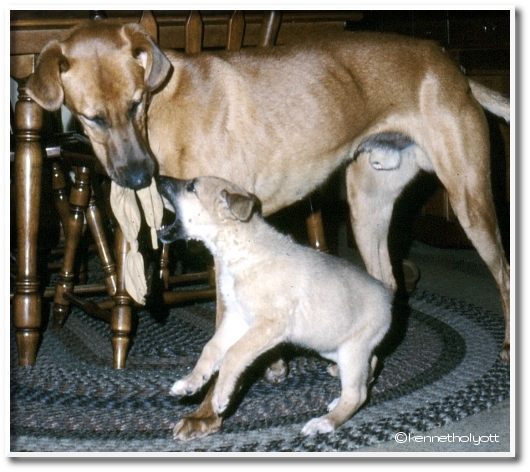 Behavior - Shy dogs, dogs that don't get along with other dogs, dogs that bark. For those who don't want more than one dog anyway, why not take in a shy dog or one that wouldn't do well in a multi-dog home? We're a one-dog only home (not by MY choice but I love my husband and want to stay married) so Bella's slightly anti-social personality isn't that big an issue for us. And we're working on improving her social skills - most dogs can learn better coping behavior if only to successfully navigate the occasional trip to the vet. PetFinder is asking shelters and rescue groups to nominate their less adoptable dogs, so I'd like to offer for your consideration, a dog from North East All Retriever Rescue, one of the groups for which I volunteer. 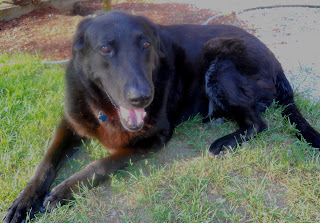 Large, black, senior and hypothyroid, Dill is a beautiful, cuddly Retriever mix looking for her new forever home. Her health conditions are manageable and she's a love of a dog who just wants a walking companion and a place to lay her head. Please consider visiting the web site to learn more about her and how she could add to your family. Of course, not everyone is going to be able to work with every special need but everyone can live just as easily with a black cat as with a white one. Those of us in the animal community be it bloggers, volunteers or workers, have to make an effort to educate, we need to be extolling the virtues of older dogs and FIV+ cats and explaining how easy some of these health conditions can be to manage. And those of us who do have the time and interest, those who want to bring out the best in our dogs and cats whether that means championship ribbons or a comfortable walk around the neighborhood, we can step up to the plate and help these dogs find forever homes with us. Welcome to the second installment of "Notes from home" where Jan shares his insights into raising Bella via email to Leslie who unfortunately has to spend her time in a corporate office. Jan: The tail has hardly stopped since I came home. She has discovered Frosty -- one of Beau's old sqeaky toys. Our worry about her not knowing how to play with toys was silly. She is carrying it around in between some serious exploring. Leslie: Isn't Frosty as big as she is? Jan: Yeah, Frosty is about as big as she is. However, many of the other toys she has since discovered (including your slippers) are smaller. We interrupt our regularly scheduled blogging of Bella to bring you this special edition. Away up north in the tiny town of St. Johnsbury, VT, lived a wonderful, whimsical artist named Stephen Huneck. Stephen Huneck loved dogs and dogs (and dog-lovers) loved Stephen. Stephen and his wife, Gwendolyn, built their home on a hill and they called that hill Dog Mountain. Near the top of Dog Mountain, Stephen built The Dog Chapel. All dogs and their people are invited to visit the Mountain any time, free of charge. There are ponds for dogs to swim in; miles of trails to wander. There are wildflower meadows and even dog parties that take place at various times during the year. If Dog Mountain is a celebration of the life of dogs, The Dog Chapel is a place to revere our bond with them and grieve the loss of beloved companions. When Stephen Huneck built The Dog Chapel, he labelled one wall 'The Remembrance Wall' thinking perhaps visitors might want to leave a picture or a note in memory of their cherished pets. I wonder if he could have ever imagined the entire Chapel would eventually be covered in Post-It Notes, color photos, copies, Polaroids, hand-written note cards and computer generated love-letters. Only the woodwork remains free of paper memories. I have been a fan of Stephen Huneck's artwork for many years. I love the whimsy, the humor and the perfect perspective of dogs he captured in his pieces. When I first heard about Dog Mountain and subsequently The Dog Chapel, I knew someday I would have to go. I had hoped, at the time, to bring my beautiful Lab boy, Beau. Beau was a happy and confident dog, perfect for mingling with the various dogs that come to visit Dog Mountain. Unfortunately, I always seemed to be "too busy", foolishly believing his life would last forever and I lost my beloved boy just days before I had planned to finally bring him there to visit. As I sat by his side in his final hours that morning, I promised him I would bring him there in spirit. Last Sunday, I kept that promise. 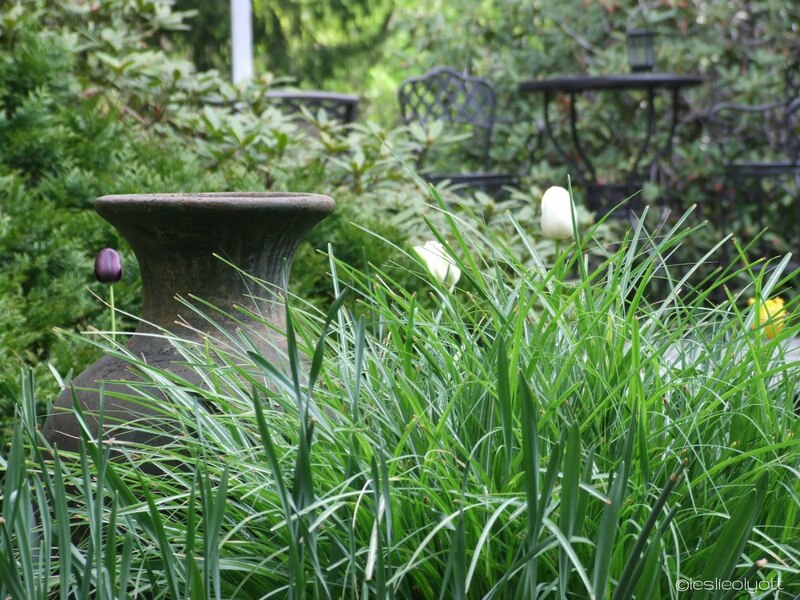 When you walk into The Dog Chapel, you can't help but feel a profound sense of loss and love. But there is also an indescribable feeling of acceptance knowing you are in the company of those deeply loved. I felt finally "understood". Beau's picture now hangs with the thousands of other beloved and mourned dogs, cats and other pets that adorn the walls of Dog Chapel. It gave me a tremendous sense of peace to honor him this way and I will take comfort now in thinking of him up on the Mountain. I imagine Rainbow Bridge might look a little something like Dog Mountain. Stephen Huneck understood the wonder and wisdom dogs bring in to our lives and he has given us a unique treasure. Sadly, he ended his life in 2010. His legacy endures. Economic hardship, however, has put the Mountain at risk. While a deal has been brokered with the town of St. Johnsbury at this time, please consider visiting the online shop and purchasing a piece of Stephen's artwork to help keep Dog Mountain open. Better still, pack a lunch and your 4-legged friends and go spend an afternoon on the Mountain. Don't wait until it's too late. Alfie's the big guy here. He was my first crazy dog, half the neighborhood was afraid of him. Part German Shepherd, part Afghan Hound, he was big, bold and lightening fast. The little tyke taking him on is Muffin. He was so good with her. And she was unspeakably sweet. In honor of the victims and the heroes, 2-legged and 4. Thanks to Ken Bell of "The Dog Files" for allowing us to embed his video to our blogs. What a wonderful tribute. Out of sheer curiosity, as well as a desire to understand the genetic components of Bella's physical and mental make up, we had her DNA tested. I didn't know it was possible but she actually failed the test. They gave us our money back. Ok, I'll give you a moment. So apparently, a DNA test can identify up to 8 different breeds in any one dog and that limit didn't go high enough to fully capture our Bella's, um, 'unique' heritage. Over time, however, and with the input of vets and trainers (and anyone else who comes in contact with her and wants to weigh in on the subject), we've been able to pull together a possible list of breeds she might have in her: Australian Cattle Dog, Basenji, Beagle, Bluetick Coonhound, Border Collie, Collie and, well, we haven't even gotten out of the "C's" yet. We've determined some of this by physical traits and some by behavior. 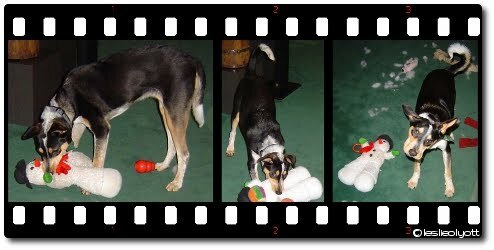 When she was smaller, she really had the body shape of a Basenji - long legs and a delicate square frame - and she still has the facial markings of a tri-color B. As she's filled out with age, her shape has taken on some of the characteristics of a Smooth-coated Collie although her nose isn't nearly as long and narrow. Of course, the mottled coloring has always suggested a bit of either Coonhound or Cattle Dog. And the tail. As close as it might get sometimes to a Basenji curl, the tail is otherwise all Beagle. Behaviorally speaking, I only noticed the potential for Border Collie in her when she did her first "Border Collie Crouch". You know the one - that moment when a BC is watching and waiting for some sheep to boldly go where no sheep is supposed to go? The head drops down, neck out and the body seems to fold into the shoulders like a swan ready for take off? I suppose most dogs left to their own devices will learn that but she just looked like a perfect herding dog, like she was born into it. She also does the Collie "Timmy fell down the well" routine particularly well. But from the perspective of behavior, Bella is most assuredly at least part Basenji. She does head stands, she can climb just about anything and she was doing the B-500 long before I even knew what it was. She has an opinion about everything and a spectacular sense of "up". She also cleans herself like a cat. Oh, and I'm pretty sure she'd rather eat glass than get her feet wet by going out in the rain. We'll never really know what her genetic heritage is and we love that she is truly one-of-a-kind. So does it really matter what breeds make up a dog? In as much as it helps us understand her motivation and set our expectations, I think, yes, to some degree, it does. Are we expecting her to be cuddly and social, constantly at our side like our velcro-Lab, Beau? Do we expect her to do what we say just because we say it? As all of the breeds we've seen glimpses of in her are independent working dogs, we'd be fighting against type and setting ourselves up for endless frustration if we did. That's not to say she's not trainable (good grief is she trainable!) or that we can't help her get past some of her resistance to things, but I think it's important for us as pet owners to set expectations of our pups based on their view of the world as well as our own. We'll get much more out of our partnership with them if we have just a little understanding of what they want out of it. So I'm really new to this blogging thing and am skating in just under the wire to participate in the Pedigree Foundation's "Write a post, help a dog" campaign this year. I promise to figure this out faster next year because it's really such a simple way to help shelter dogs. So here's the scoop: "For every post written by Sept. 3, 2011 that mentions the Pedigree Foundation, a non-profit formed to help support shelters and promote the welfare of animals, 20 pounds of Pedigree dog food will be donated to feed shelter dogs, up to 10,000lbs of food." How easy is that? There's even a "blog hop" to make sure every post is counted. 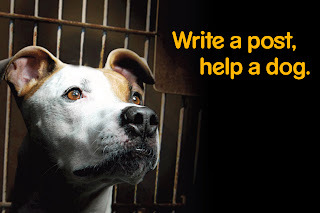 Pedigree has done an outstanding job bringing attention to the plight of homeless dogs with their Facebook campaigns, their support of Animal Planet's "Puppy Bowl" and even more impressively with their "Don't Pity a Shelter Dog, Adopt One" campaign and I'm happy to make my first contribution to their "write a post, help a dog" campaign this year. I look forward to participating again for many years to come.